Fast food in India is not served in florescent-lit golden arches like in the United States. The fast food of India is the street food served in roadside snacks stalls. 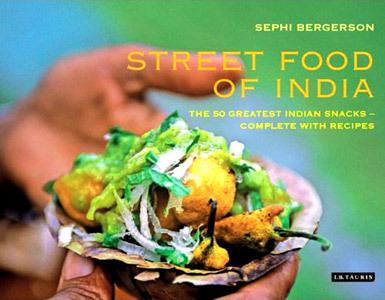 Sephi Bergerson’s book “Street Food of India: The 50 Greatest Indian Snacks - Complete with Recipes” serves as an excellent introduction to Indian street food. The biggest strength of this book is the featured photographs. The photographs are far from cliché photograph of dishes served in finest china with table decorations from Pottery Barn or William Sanoma. Bergerson captures ambiance and authenticity of how Indian street foods are prepared in India, how the street foods are served in mundane container. The “Street Food of India” book is a story of Indian street foods. It has recipes and photographs of foods. Besides that, the book also tells story of places where they are served, people who make it and people who eat it on daily basis. The recipes of featured dishes are accompanied by stunning realistic photographs of real Indian street foods. The dishes look and sound authentic, but most of them can be easily made using ingredients found in the West and the instructions sounds simple enough to be followed by someone new to the Indian food scene. Sephi Bergerson takes us in Indian street food journey from bustling streets of cities like Delhi, Mumbai, Amritsar, to dusty remote street food stalls in countryside. Example of street foods includes; meetha lassi and bhel puri; paneer tikka and masalas, chutneys, and samosas. This hardcover edition of the book is good as coffee table book that serve as a food travelogue or can double as a handy reference guide for recreating Indian street food recipe in your kitchen.